A roof coating is a fluid applied, fully adhered, monolithic roof membrane. This means that the roof top is applied in a liquid form, the liquid roof material sticks to and seals the entire roofing substrate, and when the liquid dries, it forms a seamless (monolithic) elastomeric (rubberzied) surface. Even the cants, vertical walls, parapets, and penetrations are coated, making the entire roof surface a single, seamless, waterproof protective barrier. A roof coating can be applied to almost any roof surface including, but not limited to concrete roofing, metal roofing, modified bitumen, built-up roof, smooth built-up roofing, spray foam roofs, EPDM, single-ply roofing, pedestrian decks, and wall coatings. Once applied, the coating forms a solid, durable, and elastic surface that is weather resistant and can be walked on for regular maintenance and repairs. Roof coatings are available in a variety of component bases including aluminum based coatings, acrylic coatings, butyl roof coating, silicone, urethane, polyurethane coating, and polyurea coating. Roof coating primers are a must for many roofing conditions to ensure proper adhesion of the coating to the substrate and to solve rusty metal roofing problems. At times it can be beneficial to use a mix of coating components to achieve the best adhesion of the coating to the roof surface while maximizing protection of the roof substrate. A great example of this is the Ure-A-Sil Liquid Applied roof coating system from American WeatherStar. This proprietary system was developed to bring together the exceptional adhesive qualities of urethane with the excellent durability of silicone in one easy to apply roof coating system. One great advantage to a roof coating is that, in many cases, it negates the need to tear off the old roof and haul it off to landfill. This not only saves the building owner the cost of a complete tear off, it also helps preserve the environment by reducing landfill waste. And, in most cases, a roof coating qualifies as building maintenance which can lead to huge tax breaks for the building owner. Other obvious advantages to such a roof coating are a completely waterproof roof and a stronger roof surface. Roof coatings are durable and expandable. Once cured, roof coatings can be walked on for roof top maintenance and upgrades. One hidden advantage to a roof coating is that it is elastomeric, or as it is sometimes called, a "rubber roof". Elastomeric means the coating is rubber-like and has the ability to expand or contract and then return to its original shape. This hidden benefit is very important because of its ability to handle the effects of thermocycling, which is the process of going from hot to cold, and is a major contributor to premature roof failure. Besides affordable installation, a roof coating can save the building owner with climate control and energy costs savings. A bright white roof coating can lower a building's roof top temperature by several degrees which makes it easier and more affordable to control the interior climate resulting in lower electricity bills. Less roof maintenance is also a cost saving component of a roof coating. The roof coating completely seals the roofing substrate thereby protecting and preserving the roof from premature degradation and wear. 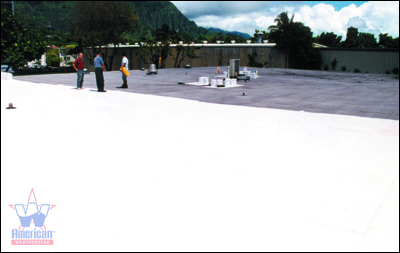 A bright white roof coating also reflects the sun's harmful UV rays away from the roof which reduces thermocycling. 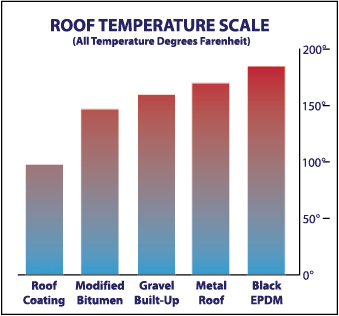 Any reduction of thermocycling can add years to a roof lifespan. With proper maintenance, most roof coatings will last for many years and are usually backed by a manufacturer's material warranty. When installed by approved dealers, some manufacturer's offer a labor and materials warranty that can extend the lifespan of a roof coating for decades. All roofing systems recommended by Houston TX Roof Repair may qualify for such an extended warranty when installed by an approved dealer.Contact us for more information on an approved roof coating dealer in your area or for more information on an extended roof coating warranty.